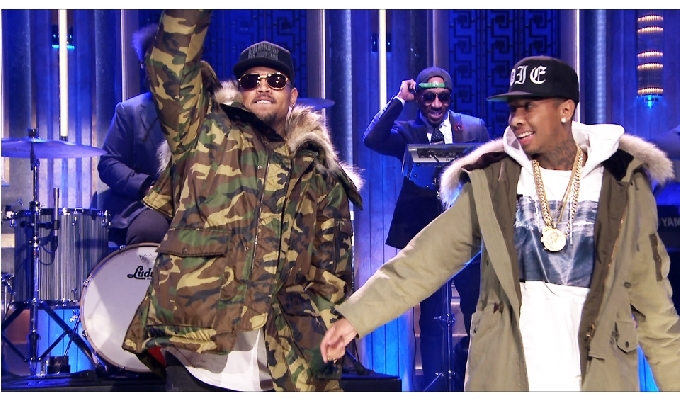 Chris Brown and Tyga continue the buzz building for their upcoming joint LP, Fan of a Fan: The Album, by appearing on “The Tonight Show” on Monday (Feb. 16). Backed by legendary band The Roots, the duo performed their single “Ayo,” for the first time on national TV. Fan of a Fan: The Album, the follow-up to their 2010 mixtape, will arrive on February 24. The set is led by the single “Ayo,” which sits at No. 13 on the Billboard Hot R&B/Hip-Hop Songs, as well as the recently released “B*tches N Marijuana” and “Remember Me.” In addition, the set features appearances from T.I., 50 Cent, Wale, Ty Dolla $ign, Pusha T, ScHoolboy Q, and Lil’ Boosie.